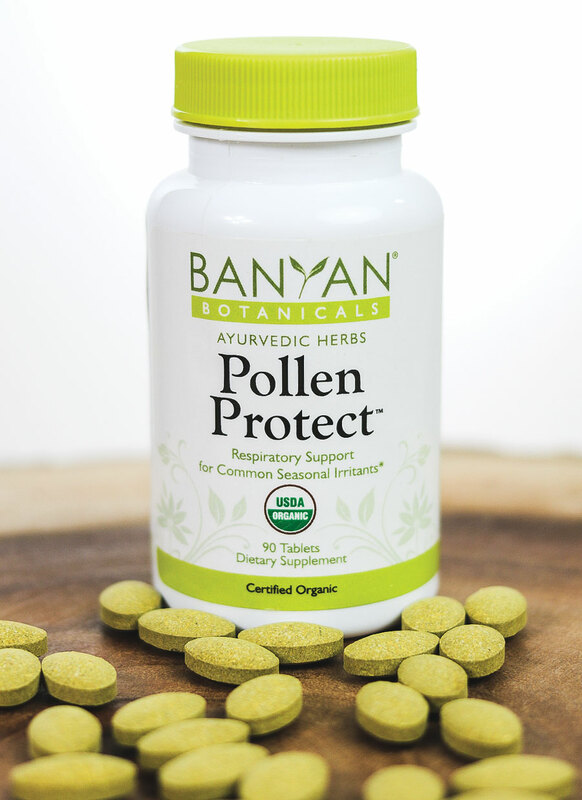 Banyan Botanicals’ Pollen Protect™ is an herbal formulation tablet with ten key herbal ingredients targeted at supporting respiratory system functions and providing relief for common seasonal irritants. As important as pollen is for our ecosystems, it can be a great source of irritation, if not outright distress, for many people. Occasional itchy or watery eyes, sneezing, and congestion are just a few signs of the respiratory tract under duress. The body normally and naturally responds to irritants with a healthy inflammatory response. In short, this response is the body’s first defense mechanism against pathogens. However, the body can be indiscriminate when it comes to foreign invaders, and pollen is treated like any other microorganism—as a threat. This is relatively common and occurs at some point in most people. Dietary supplementation through herbs can help support a healthy respiratory system and also help to moderate a healthy inflammatory response to common seasonal irritants. Total herb weight used per tablet is 500 milligrams. Several of these herbs are known for their cooling and soothing qualities. One of the mechanisms of the inflammatory response is elevated pitta, or heat in the body. Turmeric, amalaki, and guduchi all have properties to soothe excess pitta and cleanse the blood. The congestion that arises is an increase in the body’s kapha, or water and earth element. This is a natural reaction to remove everyday irritants that our respiratory tract encounters. Ginger, pippali, and chitrak all help alleviate excess kapha, while punarnava then acts to move the liquids of the body. Tulsi is warming to the circulatory system and respiratory tract, providing a soothing and nourishing quality. Finally, ajamoda acts to harmonize the whole formula and balance any excess vata or kapha. Pollen Protect recently underwent a small pilot study of seventeen participants who were challenged with moderately disturbing occasional seasonal discomfort. They were given a one-month supply of Pollen Protect tablets (3 tablets twice daily for 30 days). The participants were asked to take a 28-question validated questionnaire enumerating the challenges one may experience with common seasonal irritants. Participants took this questionnaire on day 1, before taking Pollen Protect tablets; on day 30, they answered the same questions again and their scores were then compared. Statistically, we used a normality test to determine whether our sample size of seventeen participants is truly representative of the general population who face trouble with occasional seasonal discomfort. Our data set passed this test and was indeed statistically representative of this population (alpha= 0.05). 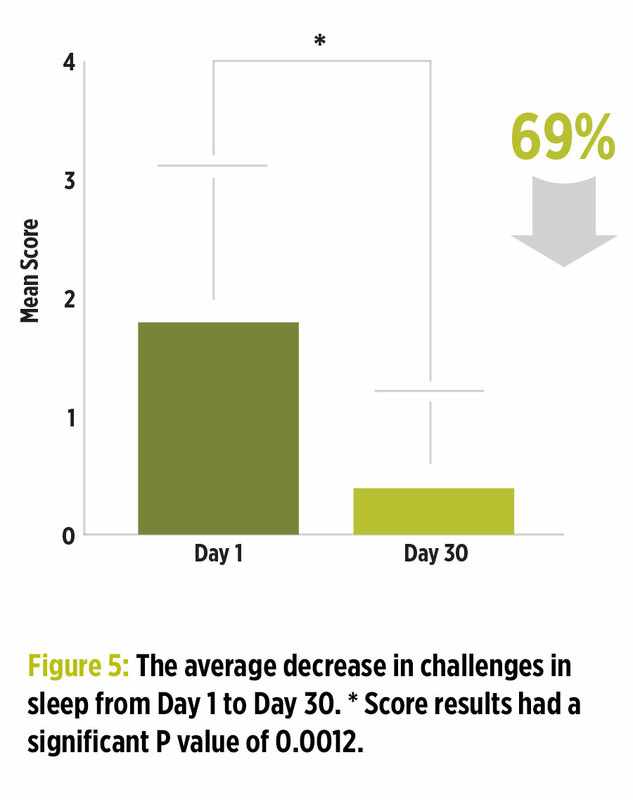 After 30 days of using Pollen Protect tablets, the results of the participants showed an overall decrease (as shown by an average of the scores for all 28 questions) in seasonal irritant challenges by a whopping 66%! When looking at the individual data domains, we were further reassured. 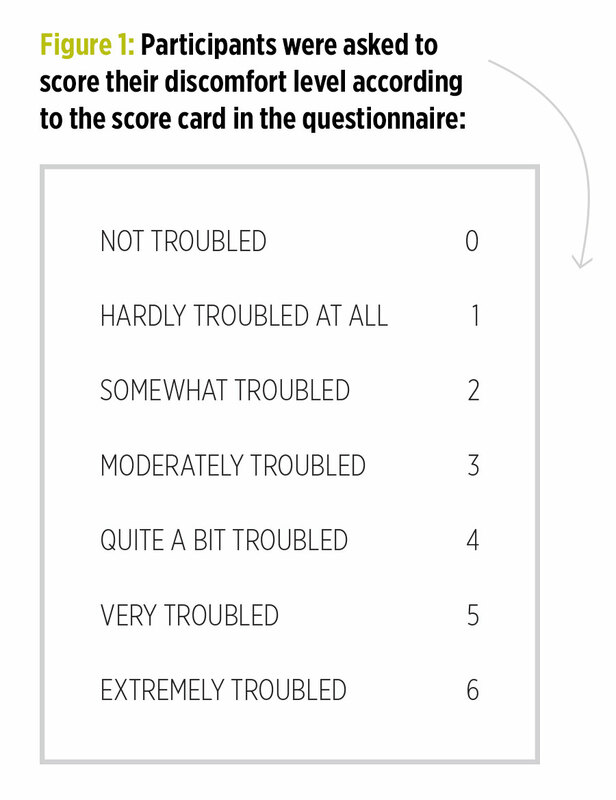 The 28 questions were grouped into seven domains or categories of challenges. 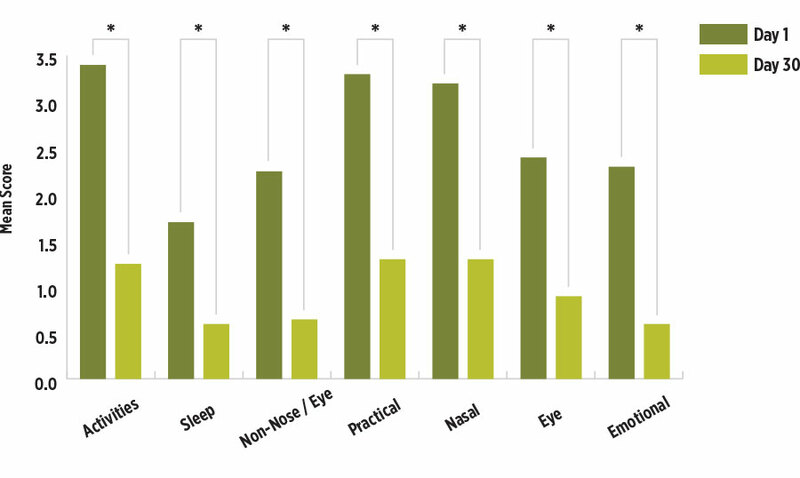 These categories represented the general effect seasonal difficulties had on daily activities, sleep, non-nose/eye challenges, practical problems, nasal challenges, eye challenges, and emotional state. All domains showed a significant change and decrease in difficulty with seasonal irritants. 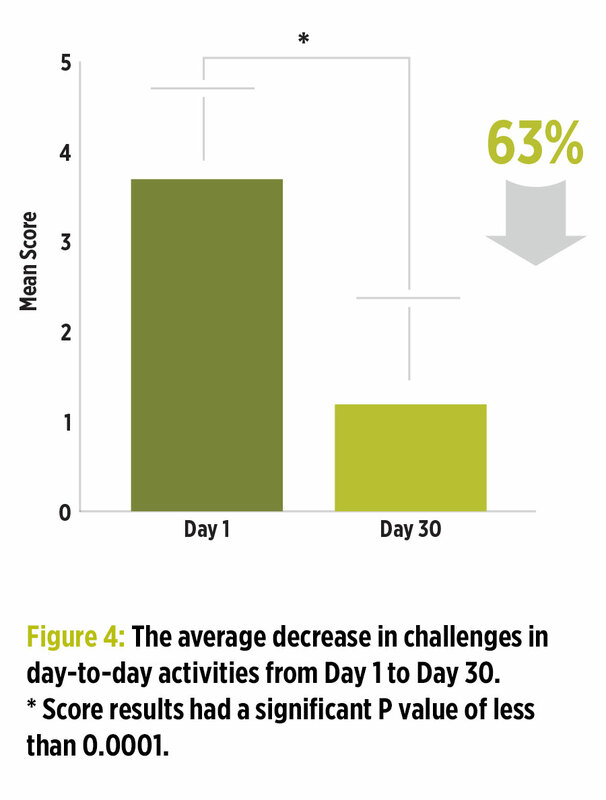 The most notable difference in score was in the domain of day-to-day activities, where participants reported that their challenges decreased by a remarkable 63%; and work-related activities showed a 71% decrease in challenges. The questions for this domain focused on challenges unrelated to nose or eyes and showed very significant improvements. Questions pertained to particular challenges such as fatigue, thirst, concentration, and productivity. 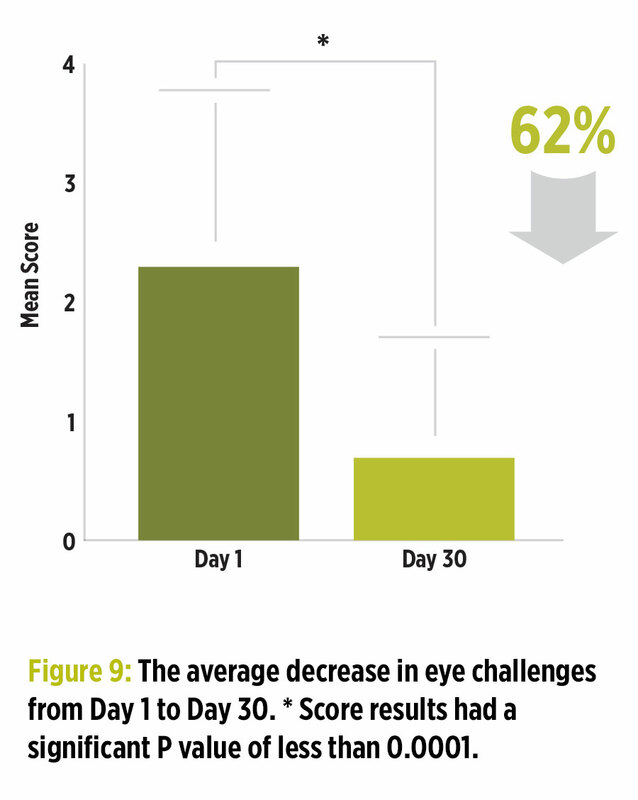 These challenges showed a significant decrease of 72%. Participants reported that their productivity, in particular, was immensely improved. The fourth domain concerned questions on the practical problems participants face while challenged with seasonal discomfort. For instance, how inconvenient was it for the participant to be carrying tissues or handkerchief, needing to rub nose or eyes, and other related challenges. 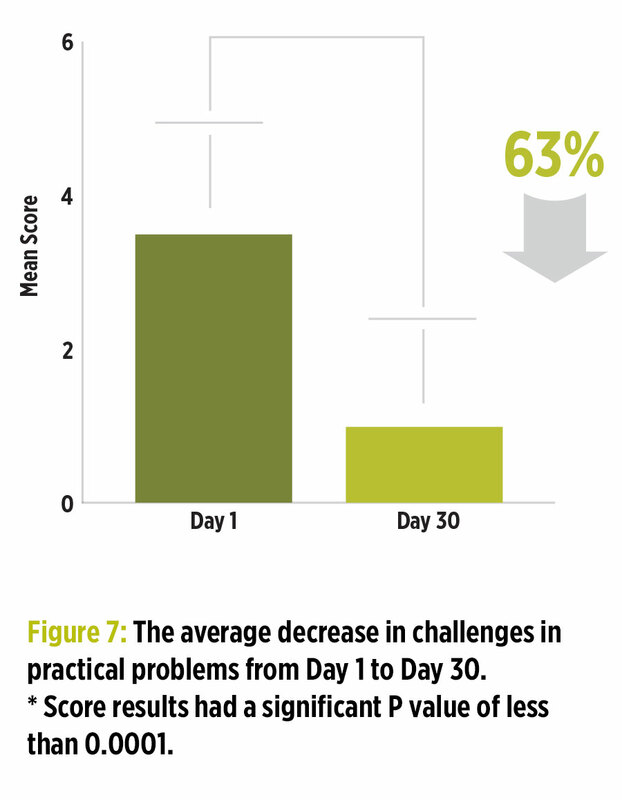 At the end of the study, there was an overall decrease in challenges by 63% in this domain. 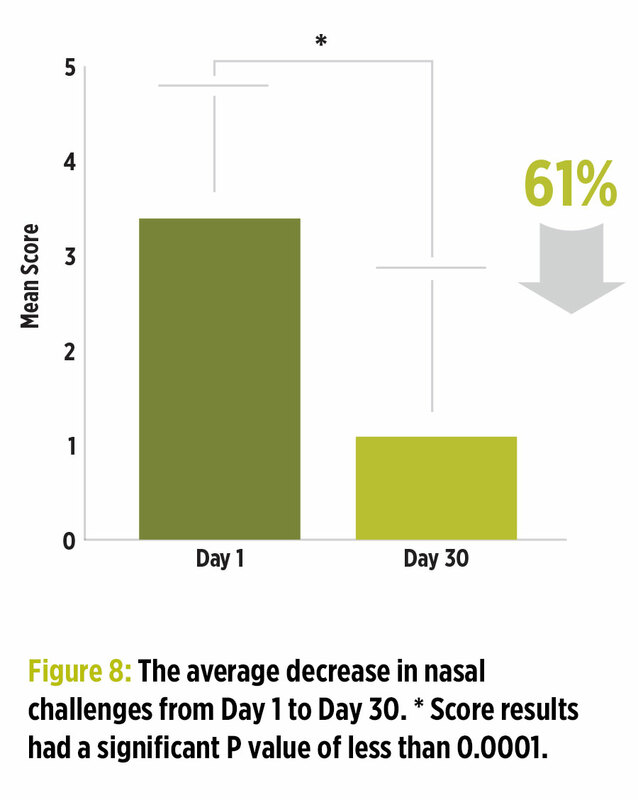 The fifth domain focused on nasal challenges, which showed a 61% decrease. The sixth domain targeted eye challenges, such as occasional itchiness or watery eyes. 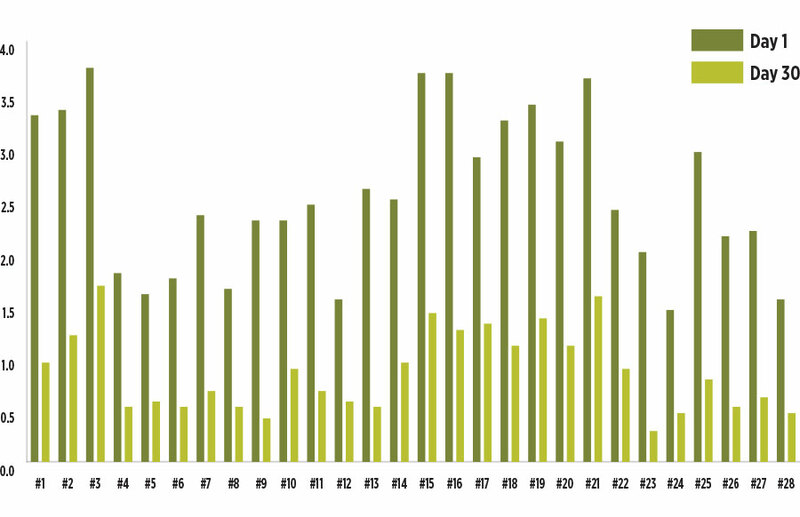 This domain showed an average of 62% decrease after taking Pollen Protect over the study period of 30 days. We selected a questionnaire that addressed every perspective of an individual when faced with seasonal discomfort challenges. The last domain focused on the participants’ emotional state when faced with challenges from seasonal discomfort. 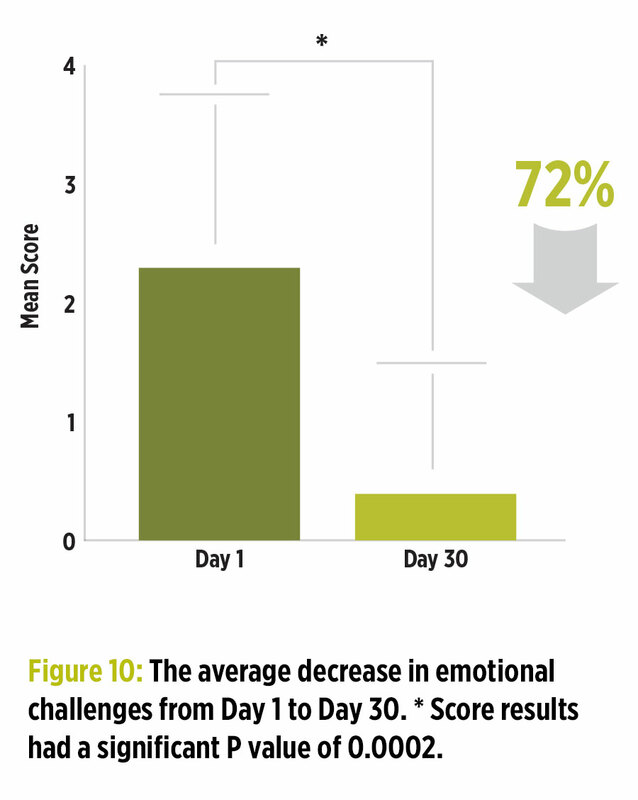 The results revealed a 72% overall decrease in emotional challenges, such as frustration or embarrassment. 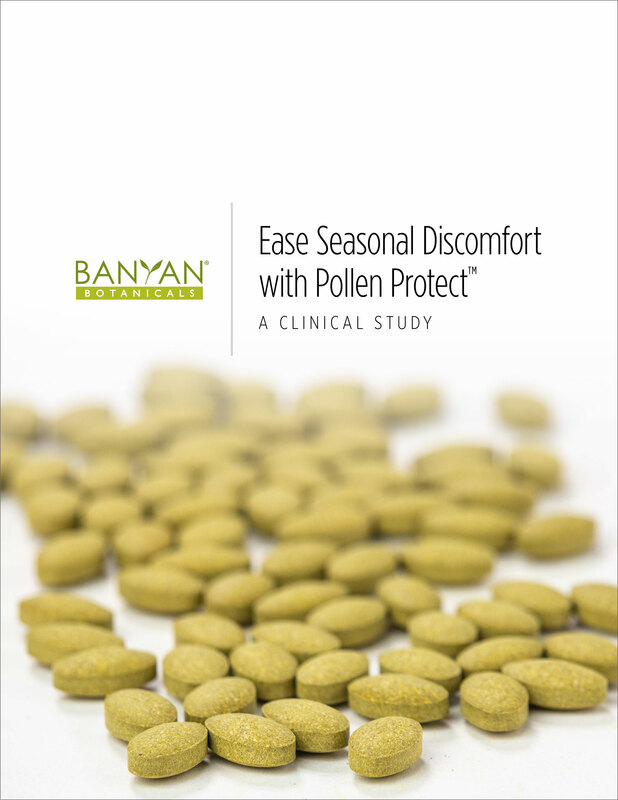 Perhaps most importantly, many participants reported that their restlessness and irritability decreased by 75% after using Pollen Protect tablets. In addition to evaluating the questionnaire per each domain, we also performed the same tests on each question (1–28) to make sure that the results obtained were statistically significant in decreasing the occasional challenges of seasonal discomfort after taking Pollen Protect. 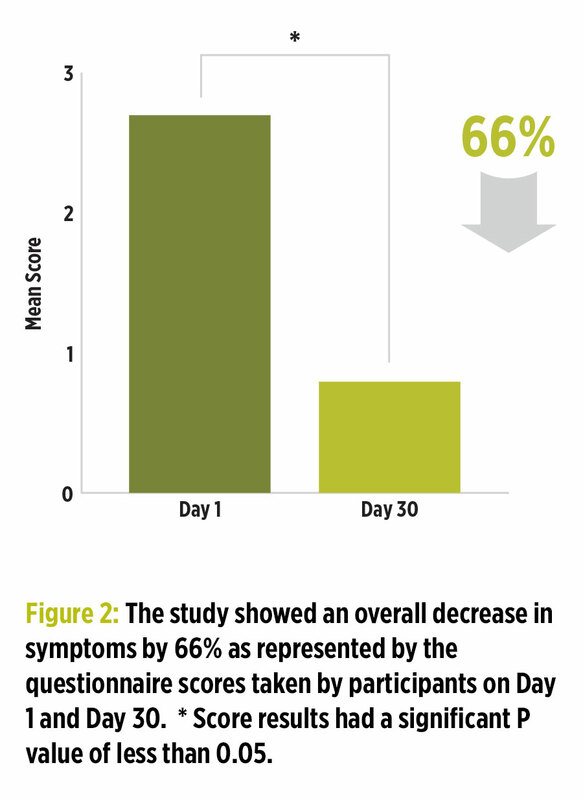 There was significant decrease in symptoms for each question. While this study was truly a pilot study in that it was not placebo-controlled and had a small sample size of seventeen participants, we feel that the results were revealing in demonstrating the potential for Pollen Protect to support the respiratory system and a healthy inflammatory response due to seasonal irritants. Throughout the study, all participants were carefully monitored for any adverse events; no adverse events or side effects were reported by the participants while taking the supplement tablets during the study period. There were three out of twenty participants who dropped from the study due to the severity of their challenges at the time. They opted to resume their routine regimen that involved various over-the-counter products. This is a great and promising first step in our research for Pollen Protect and we plan to use the information to design a larger, controlled study. Vrinda Devani, M.D. is the Director of Product Development and Research at Banyan Botanicals. As an Obstetrician and Gynecologist, she has a passion for women’s health and empowering women towards vibrant health and living. She is a believer in unfolding the human body’s potential through a blend of complementary and allopathic medicine. She has studied Ayurveda extensively under Dr. Vasant Lad and furthered her studies in Ayurvedic women’s health with travels in Nepal with Dr. Sarita Shrestha. In addition to being a physician and certified Ayurvedic practitioner, she also has a love for yoga and is a certified AyurYoga teacher. How would your life be different if your breath were more relaxed, more fluid—less disturbed by congestion, cough, stress, or anxiety—if you could simply breathe easy?